Manitoba MP Niki Ashton is the newest, and youngest, candidate in the NDP federal leadership race after declaring her candidacy Monday in Montreal. 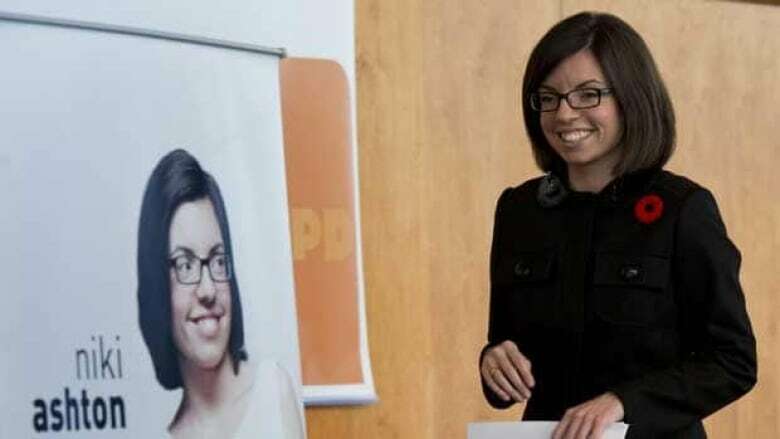 Manitoba MP Niki Ashton announced Monday that she will try to become the next federal leader of the NDP. She officially declared her candidacy at an event in Montreal. "Today I am asking for your support to be the next leader of the NDP and the next prime minister," Ashton said. She was introduced at the event by Quebec MP Jean-François Larose and delivered her speech equally in French and English. Ashton spoke about the "old politics" of Prime Minister Stephen Harper, saying his style is divisive, and she laid out her vision for "new politics," saying it is about equality, the environment, peace, culture, community and innovation. "New politics sees greater equality as key to Canada's future. It sees that poverty is unacceptable, starting with the third world conditions that face aboriginal people today in a country as wealthy as Canada," said Ashton, adding that new politics also sees climate change as a key challenge. "New politics says it does matter who owns our economy and we must protect our public services and that we must control our economic destiny as Canadians," she said. The NDP's leadership race was prompted by the death of Jack Layton in the summer and Ashton said she wants to build upon his legacy. "I am part of the Jack Layton generation," the 29-year-old MP said. Ashton noted that in 2008 she was the youngest woman elected to the House of Commons. "Today, there are many young MPs, many women, many people of different backgrounds that join us there. Together we have broken down barriers," she said. "New politics says that age is not a barrier," Ashton said. Who should lead the NDP? Take our survey. Launching her campaign in Quebec was partly done to recognize the support of the province in boosting the NDP to Official Opposition in the spring election, Ashton said, and tomorrow she sets off to campaign across the country. Her first stop is in Calgary. Ashton is the ninth person to join the leadership race and the seventh NDP MP. She joins Peggy Nash as another female candidate but is the only one in the race from the Prairies. Robert Chisholm, Nathan Cullen, Paul Dewar, Thomas Mulcair, Nash and Romeo Saganash are Ashton's fellow MPs that are in the race so far and the other candidates are Brian Topp, the NDP's former president who stepped down to enter the race, and Nova Scotian Martin Singh. The NDP will elect its new leader in March at a convention in Toronto. The contest was prompted by the death of the NDP's leader Jack Layton in August. Quebec MP Nycole Turmel is serving as the interim leader. Ashton followed in her father Steve's footsteps when she decided to pursue politics; he has been a provincial MLA in Manitoba for 30 years and is currently a cabinet minister. Ashton has held critic roles in the past for the NDP, but currently does not have one. The NDP has set a rule that MPs in the race have to give up their critic roles. Ashton is chair of the status of women committee, one of five committees that has an opposition MP as the chair. She is only one of two Manitoba MPs in the NDP caucus and the Conservative government's plan to scrap the Canadian Wheat Board has been a major issue for her. She also takes a special interest in aboriginal affairs. Scrapping the long-gun registry has been a particularly controversial issue for Ashton as MP for a northern Manitoba riding, one that has a heavy aboriginal population. She has sided with the government before and voted to abolish the registry when a private member's bill on it was before the House of Commons. But she has since changed her mind and on the government's new bill to eliminate the registry she voted last week with her party and against the government. Ashton addressed the flip-flop Monday. "I support the fact that Quebec wants a registry, that it is very important that the federal government be there to support Quebec and other regions that want a registry. That is why I voted the way I did last week in the House of Commons. Prior to that it has also been very important for me to bring forward the fact that regions and people, such as northern and aboriginal people have real concerns with the registry," she said. P.O.V. : Who do you think should lead the NDP? Meet Martin Singh, the next NDP leader?